Coolant or antifreeze is a essential additive to your vehicle’s engine. 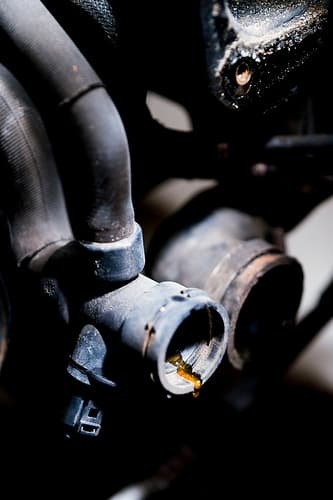 Coolant has a tendency to break down and lose its properties as well as accumulate rust particles, sludge and dirt. Changing the coolant per the manufacturer’s recommended intervals in your pickup will flush the water jackets and passages clean and keep the engine running at optimum performance levels. To provide sufficient clearance if your truck sits low to the ground, jack up the front of the truck at the cross frame location and place two jack stands under each wheel. Place the jack stands on the inside of each wheel under the support frame. Do the same with the rear wheels; just make sure the height level is the same for all the jack stands. This will also allow clearance for a deep drain pan. Proceed to the next step. If your truck has sufficient clearance, you will need only to place a catch pan under the radiator drain plug (petcock valve), and loosen the drain plug. Remove the radiator cap to allow the air pressure to fully drain the radiator. After the radiator is fully drained, tighten the drain plug. If your truck is equipped with a block drain plug, then you will remove (or loosen) it to allow the engine block to fully drain in the same manner as the radiator. Make sure you tighten both drain plugs with moderate torque—do not over-tighten them. To remove the water from an engine block that does not have a block drain, drain the radiator and keep the drain plug open. Insert a garden hose into the top of the radiator cap opening and turn the water on to a moderate level. Make sure the truck has the emergency brake engaged and that it is in neutral (manual transmission) or in the “Park” position for an automatic. Start the engine. Adjust the flow coming out of the garden hose to match the flow exiting the radiator drain plug. When the thermostat opens, all of the water in the block, hoses, heater and water pump will circulate and exit the radiator. Run the engine until the water exiting the radiator is clear, then shut off the engine and turn the hose off. Let the radiator drain until it is empty and then tighten the radiator drain plug. Look up the capacity (gallons) of your truck’s cooling system in your owner’s manual. Half the number of gallons to determine how much coolant you will need. A safe and recommended coolant to water ratio is 50/50, or whatever your owner’s manual dictates. For example, if your cooling system capacity is 10 gallons, then you will add five gallons of coolant to your radiator. Once you have added your coolant to the radiator, top it off with water and replace the cap. Start the engine and wait for the thermostat to open. An opening thermostat will be evident by a slight change in engine RPM or the activation of the electric cooling fan. Shut the engine off. Carefully remove the radiator cap. If the radiator cap has a pressure release valve, open it to allow excess pressure to escape before removing the cap. Insert the garden hose and top-off the radiator again. Replace the cap and start the engine, letting it run until it reaches normal operating temperature. Check for any leaks at the hoses, clamps or drain plugs.